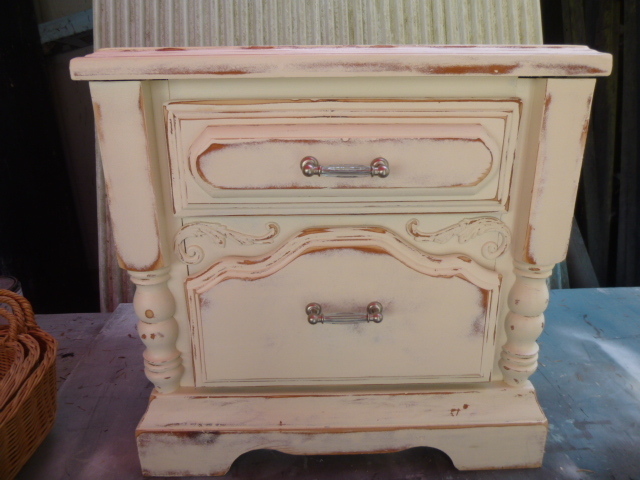 Two drawer nightstand make over: Outdated – UPdated. 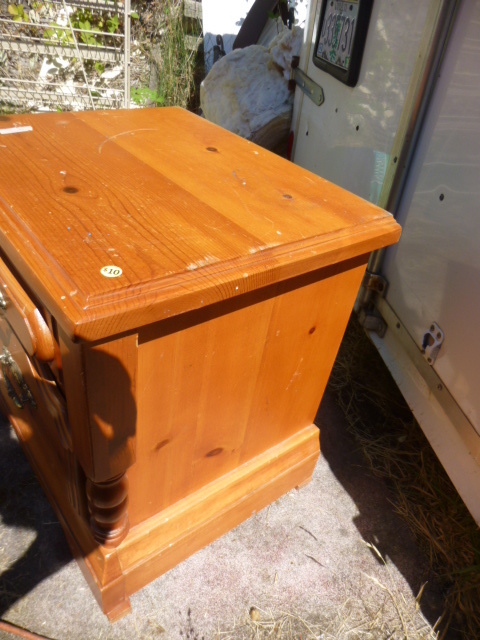 Remember when big CLUNKY furniture like this was ‘in style’? I didn’t really even like it ‘back then’! 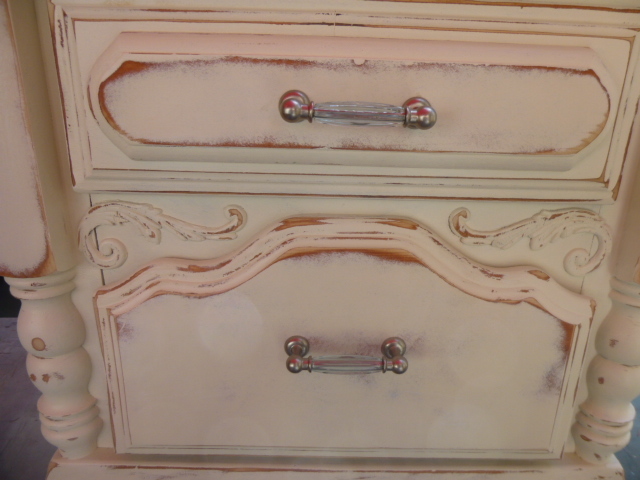 But white paint can make just about anything look soft and sweet! 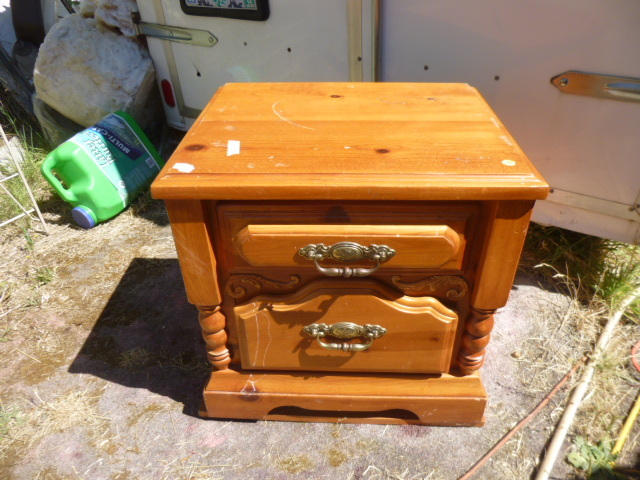 It had a satin finish, and was pretty scratched up, so it needed a really good sanding to prep before painting. A bit MORE hand sanding that I ‘like’ to have to do, but ‘the price was right’ so a little extra work was worth it! 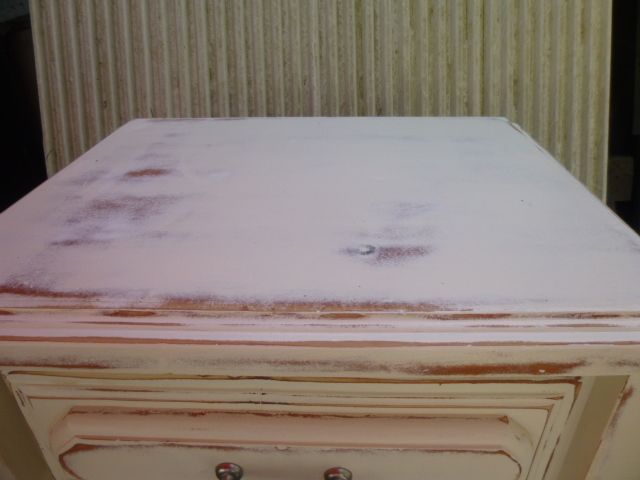 Two+ coats of paint (the detailed areas that had to be painted by brush needed a third coat of paint; larger areas that I could ‘roll’ paint on just needed two) and some sanding; both by hand (detailed areas) and orbital sander (flat surface areas); some new drawer pulls and it’s an entirely NEW piece! The new drawer pulls were a thrift store find, still in the original packaging and had a grey background, so I didn’t notice that they were actually a very pale AQUA in the center. (Happy accident!) 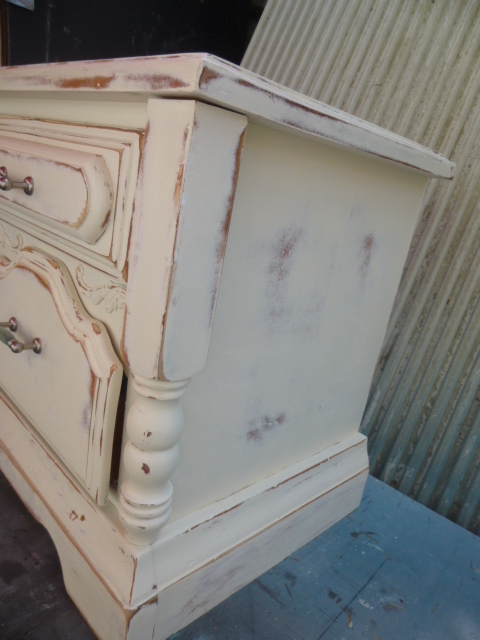 I had some other pulls to choose from, but they all had WHITE handles and the white was TOO white to go with the creamy white paint finish. 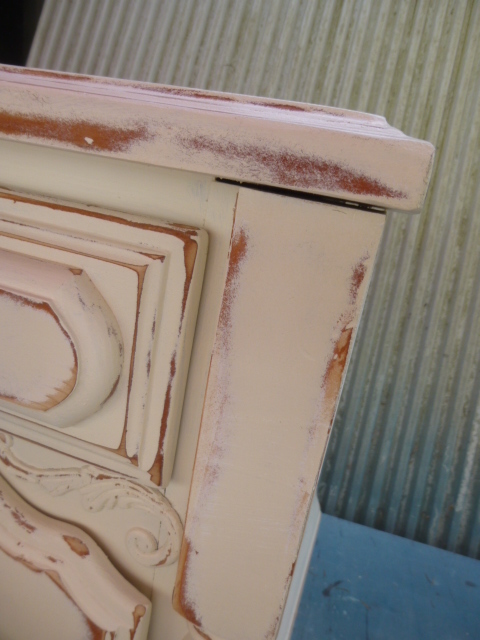 Differing levels of sanding (some spots ALL the way to the wood, and some just through a layer of the paint) add more depth to the piece and help it look more ‘naturally distressed’. 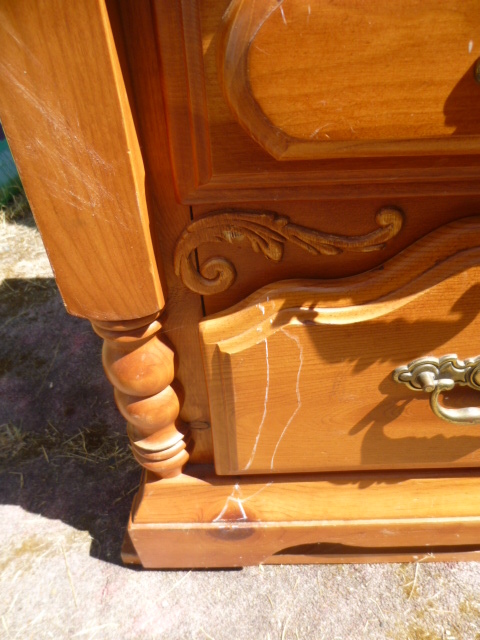 The backing was particle wood (YUCK!) so I painted over it. Applied two coats of varnish to the TOP only. 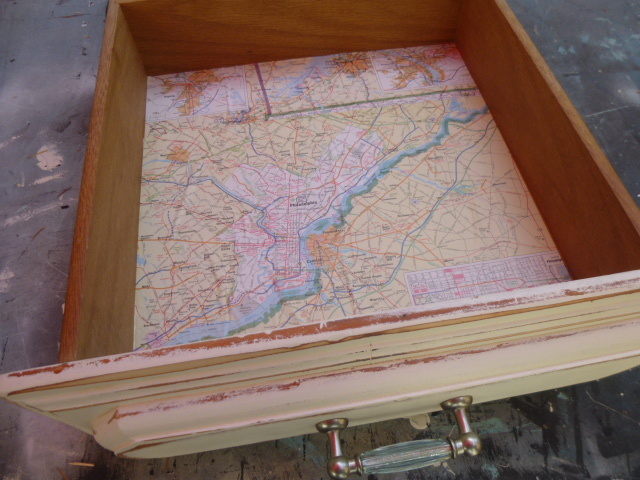 The drawer ‘innards’ were in pretty good shape, just a few ‘pen marks’; still I decided to add some paper as a drawer liner; using old road atlas pages, glued to the bottom. I think I’m going to hang on to this one for now. Have a bedroom make-over rattling around in my head that I might want to save it for. I love what you do with the furniture. I wish I had more bedrooms so I could furnish one with your furniture. So pretty! Can you do a YouTube video on how you do this? Believe me, if I lived closer and not on the East Coast, I would be shopping every week at your shops!!! Love!